Even after the late summer sun has slipped below the horizon, clouds far above the Earth’s surface reflect the waning rays of light. 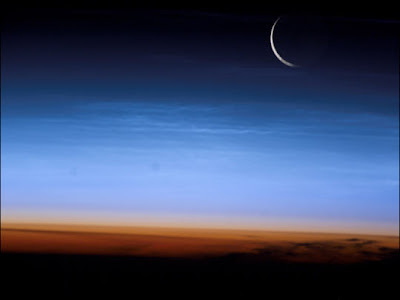 These noctilucent clouds have only appeared in the last two hundred years. Composed of microscopic ice crystals, they form fifty miles up; by comparison, white puffy clouds are only a few miles up. In recent years the clouds have appeared to grow brighter, leaving scientists wondering why.